In 1961, the Pasadena, California-based Jet Propulsion Laboratory (JPL), a spaceflight engineering laboratory managed by California Institute of Technology on contract to NASA, began study of Voyager, a robotic spacecraft program for exploring Mars and Venus in the late 1960s and 1970s. NASA Headquarters formally approved Project Voyager in 1964. Cuts in NASA's space science budget and debate over how Voyager should be managed and launched delayed NASA's push for a formal "new start" until January 1967, when President Lyndon Johnson's Fiscal Year (FY) 1968 NASA budget called for $71.5 million for the new program. In January 1967, NASA's Office of Space Science and Applications published a 26-page brochure as part of its efforts to move Voyager from planning to development. The brochure was an introduction (and sales pitch) aimed at members of Congress and other individuals who would need to support Voyager if it was to become part of NASA's approved planetary exploration program for the 1970s. [ s ]uccesses already achieved in the 1960s with unmanned spacecraft of limited weight and power. . .foretell the great work of exploration that lies ahead. . .With Voyager, the U.S. capability for planetary exploration will grow by several orders of magnitude. . .Voyager could well be the means by which man first learns of extraterrestrial life. NASA, the brochure explained, favored Mars over Venus as Voyager's first exploration target because "the high surface temperatures on Venus make the existence of extraterrestrial life less likely than on Mars" and because "the thin, normally transparent Martian atmosphere is conducive to detailed scanning of its surface features from orbit." In addition, "manned landings on Mars will someday be possible. . .[but] they may not be possible on Venus." The brochure placed Voyager within an evolutionary robotic exploration program designed to take advantage of low-energy Earth-Mars transfer opportunities that occur every 26 months. It retroactively made Mariner IV, which had flown by Mars on 14-15 July 1965, the first mission in its program. 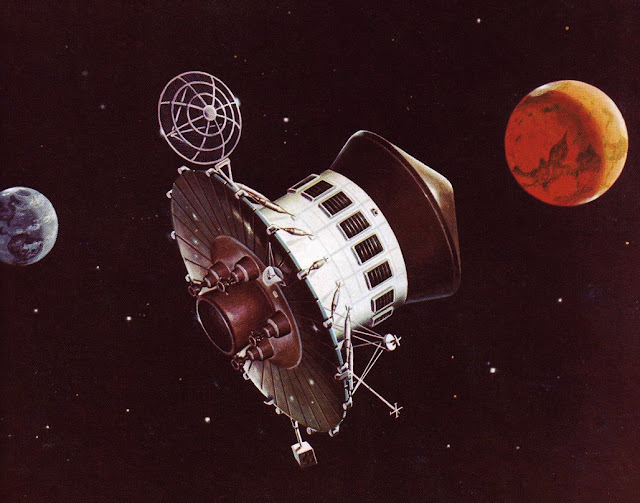 Inclusion of Mariner IV, the first successful Mars explorer, is somewhat ironic, for its discoveries had helped to undermine support for Voyager. In addition to recording for slow playback 21 black-and-white images that took in about 1% of the martian surface, Mariner IV had enabled Earth-bound scientists to measure martian atmospheric pressure by transmitting its feeble radio signal through the planet's atmosphere as it passed behind the planet as viewed from Earth. Based on the degree of refraction of the signal, scientists had determined that surface pressure on Mars is not, as expected, about 10% of Earth sea-level pressure; it is, in fact, less than 1% of Earth sea-level pressure. The brochure acknowledged that the new atmosphere data had forced a redesign of the Voyager landing system. The new design replaced lightweight parachutes with heavier landing rockets. According to historians Edward Clinton Ezell and Linda Neumann Ezell, writing in their 1984 NASA-published history On Mars: Exploration of the Red Planet, 1958-1978, the redesign bumped Voyager's projected cost above the psychologically significant $1 billion mark. Adoption of the Saturn V launch vehicle in place of the Saturn IB with a Centaur upper stage — a move designed to justify continuation of the Saturn V assembly line after Apollo and to provide flexibility in the event that Voyager redesigns significantly boosted its mass and heat shield diameter — pushed the price-tag past $2 billion. The brochure called for new Mariner Mars flybys in 1969 and 1971. In 1969, a Mariner spacecraft would photograph the entire visible disk of Mars during approach and return detailed images of 10% of the planet. During the 1971 flyby, a Mariner would release a small sterilized probe into the martian atmosphere to measure pressure, density, temperature, and composition as it plummeted toward surface impact and destruction. The flyby spacecraft would act as a relay for probe signals and would image 10% of Mars at high resolution. The first Voyager missions would take place in 1973. A battery-powered Voyager Lander with a mass of up to 390 kilograms would seek life and observe changes at the landing site over several days, and a solar-powered Voyager Orbiter would observe seasonal changes on a planet-wide scale for months. The Voyager 1975 orbiters and landers would rely on Radioisotope Thermoelectric Generators (RTGs) for electricity. This would allow the landers to survive on Mars for one martian year (about two Earth years); that is, long enough for them to observe seasonal changes at their landing sites. Voyager could land up to 499 kilograms on Mars in the 1975 opportunity. The 1977 and 1979 Voyager missions would see introduction of a lander-deployed Mars surface rover and biological experiments specially designed to study any living things found in 1973 and 1975. A Voyager lander could deliver up to 680.4 kilograms to the surface of Mars in 1977 and 1979. 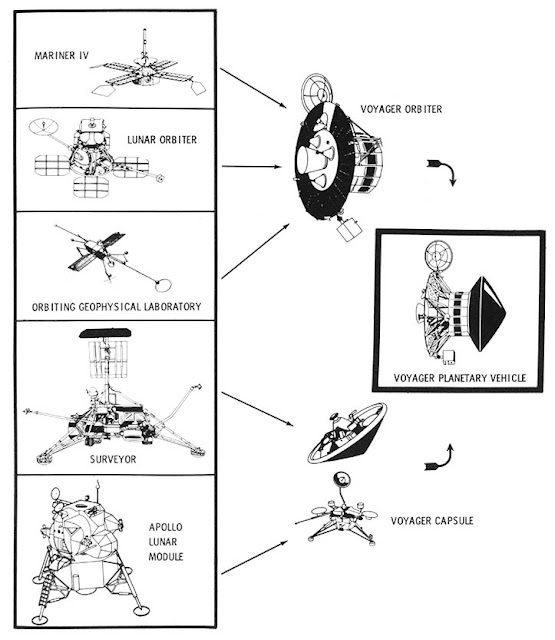 The brochure then detailed the 1973 Voyager Mars mission, which it described as typical. Voyagers would lift off from the Kennedy Space Center Complex 39 launch pads NASA built for the Apollo Saturn V launches. The 1970s Mars launch windows would last at least 25 days and would include daily one-hour launch opportunities. 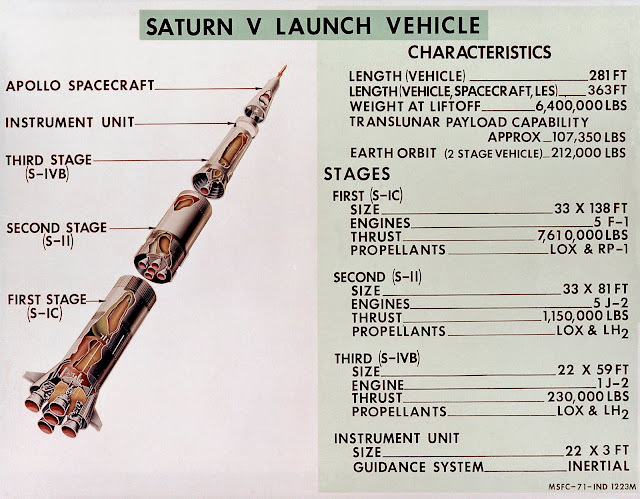 Voyager Saturn V rockets would be identical to Apollo lunar Saturn Vs; that is, each would consist of an S-IC first stage with five F-1 engines, an S-II second stage with five J-2 engines, and an S-IVB third stage with one J-2. The twin Voyager lander/orbiter combinations would be stacked atop the S-IVB third stage within a protective launch shroud. The first stage would burn for 2.5 minutes and fall away at an altitude of 62.8 kilometers, then the second stage would burn for 6.5 minutes and fall away at an altitude of 182.5 kilometers. The third stage would fire briefly to place itself, the twin Voyagers, and their launch shroud into Earth parking orbit. Voyager's launch shroud would measure 6.7 meters in diameter - the same diameter as the S-IVB stage - and would have a mass of 4.7 tons. Once in Earth orbit, the shroud's conical top section would jettison, exposing the upper Voyager to space. The S-IVB stage would then ignite a second time to push the Voyagers out of Earth orbit toward Mars. After S-IVB shutdown, the upper Voyager would separate. The shroud's cylindrical central portion would then jettison to expose the lower Voyager, which would separate from the S-IVB a short time later. In the 1973 opportunity, each Voyager would have a mass of 10.25 tons after separation. During the months-long interplanetary cruise, the twin Voyagers would turn their ring-shaped body-mounted solar arrays toward the Sun. They would use course-correction engines based on the Minuteman missile second-stage engine to place themselves on precise paths to Mars. The S-IVB stage trailing them would make no course adjustments, so would miss the planet by a wide margin. Because the Voyagers would perform their course corrections at different times, they would arrive at Mars up to 10 days apart. As each Voyager neared Mars, it would fire its main rocket engine to slow down so that the planet's gravity could capture it into an elliptical orbit. Initial orbit periapsis (low point) would be about 1127 kilometers above the planet, while apoapsis (high point) would occur beyond the orbit of Deimos, the outer martian moon, which orbits at a mean altitude of 22,660 kilometers. The brochure noted that the leading Voyager main engine candidate was a modified Apollo Lunar Module descent engine. The complete Voyager Orbiter propulsion system fully loaded with propellants would weigh 6.5 tons. After orbit insertion, the Orbiter's instruments would be turned toward Mars to image candidate sites for the first Voyager landing. After scientists and engineers on Earth settled on a site, the 2.5-ton Voyager landing capsule would eject its sterilization canister, separate from the Orbiter beyond Deimos, and fire a 188.2-kilogram solid-propellant deorbit rocket to change its path so that at periapsis it would intersect the martian atmosphere. The deorbit rocket would then detach. The Voyager landing capsule would enter the martian atmosphere moving at between two and three miles per second. Aerodynamic braking using the 6.1-meter-diameter conical heat shield would cut speed to between 122 and 305 meters per second by the time the capsule fell to within 4570 meters of the surface. The heat shield would eject, then the Lander would fire its descent engines and deploy a supplemental parachute. During descent, the Lander would image the surface and collect atmospheric data. It would release the parachute, then slow to a hover three meters above Mars. Its descent engines would then shut off, allowing it to drop to a gentle touchdown on three legs. The 1973 Lander would include 136.1 kilograms of science equipment. Over several days, it would search for water and life, measure cosmic and solar radiation, and study the atmosphere — it would, for example, measure the quantity of dust in the martian air. 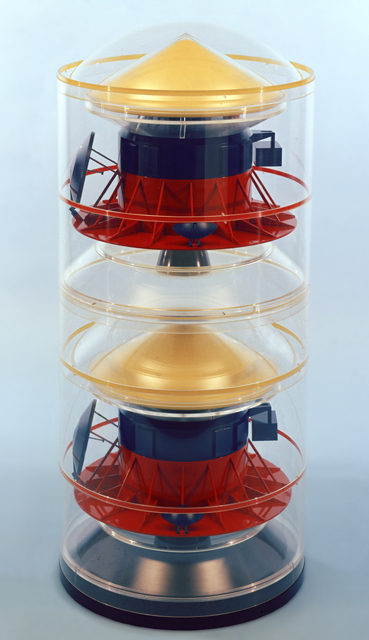 The 1973 Orbiter, for its part, would include 181.4 kilograms of scientific instrumentation, which it would use to map Mars in detail and search for surface changes over time, determine its surface composition, and measure solar and cosmic radiation. The Orbiter would also act as a martian weather satellite. It would, the brochure explained, use its main engine to change the altitude and inclination of its orbit several times during its two-year operational lifetime, allowing detailed study of much of Mars. Congress refused to fund Voyager in FY 1968, in part because it had come to be seen as a lead-in to a costly post-Apollo manned Mars/Venus flyby program, and also because the Apollo 1 fire (27 January 1967) undermined confidence in NASA. The U.S. civilian space agency formally abandoned its Voyager plans in September 1967. In 1968, however, Congress agreed to fund the Viking program in FY 1969. Like Voyager, Viking would emphasize the search for life and would use twin spacecraft, each including a lander and an orbiter. Unlike its ill-starred progenitor, however, Viking made no claim to be a precursor for a piloted Mars mission. In addition, Viking would be managed by NASA's Langley Research Center, not JPL, though the later would build the Viking orbiters. Many interpreted assignment of Viking management to Langley as a congressional rebuke to JPL for its independent mindset; efforts to preserve NASA centers as Apollo spending began to wind down probably also played a role. Twin flyby Mariners 6 and 7 flew by Mars in 1969, and Mariner 9 orbited the planet in 1971-1972. After skipping the 1973 Mars launch opportunity, NASA launched Viking 1 on a Titan-IIIE rocket with a Centaur upper stage on 20 August 1975. Viking 1's Mariner-based, solar-powered orbiter and RTG-powered lander together weighed about 2.56 tons at launch. After deploying the lander in Mars orbit, the Viking 1 orbiter weighed about 898.1 kilograms. The Viking 1 lander became the first spacecraft to land successfully on Mars on 20 July 1976, seven years to the day after Apollo 11 became the first manned lunar lander. The lander had a mass of about 598.7 kilograms after touchdown; of this, about 42.2 kilograms comprised scientific instrumentation. Viking 2 launched from Earth on 9 September 1975, and its lander touched down on 3 September 1976. At about three meters wide, the Viking landers were about half the size of the planned Voyager landers. NASA and JPL recycled the Voyager name in 1977, applying it to twin Mariner-derived Jupiter-Saturn flyby spacecraft (the mission was originally called Mariner Jupiter-Saturn 77). Voyager 2 left Earth first, on 20 August 1977, atop a Titan III-E/Centaur. Voyager 1 launched 16 days later, on 5 September. Voyager 1 passed Voyager 2 on 19 December 1977, as the twin spacecraft traversed the Asteroid Belt between Mars and Jupiter. 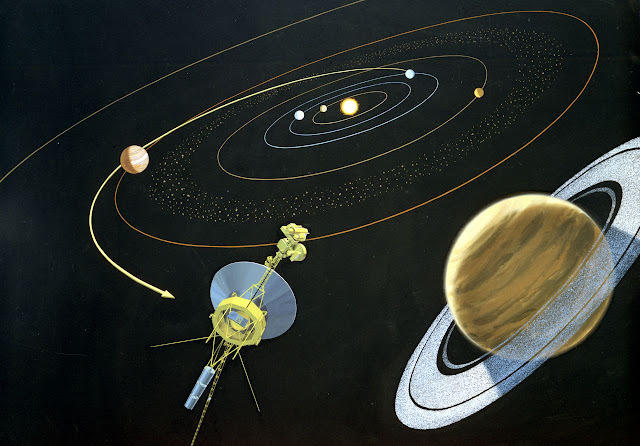 At each planet, the Voyagers performed a gravity-assist maneuver; that is, they used the target planet's gravity and orbital motion to speed themselves onward to their next destination. Voyager 1 flew by Jupiter at a distance of 349,000 kilometers on 5 March 1979; Voyager 2 followed on 9 July 1979, passing the giant planet at a distance of 570,000 kilometers. Voyager 1 then flew by Saturn, its last planned target, at a distance of 124,000 kilometers on 12 November 1980. Voyager 2 passed Saturn at a distance of 101,000 kilometers on 25 August 1981. By that time, the decision had been made to add Uranus and Neptune to Voyager 2's list of targets. The intrepid spacecraft flew by the former at a distance of 81,500 kilometers on 24 January 1986, and passed the latter at a distance of just 4951 kilometers on 25 August 1989. The Voyagers continue to transmit data on space conditions beyond the planets. At this writing, Voyager 1 is 144.7 Astronomical Units (AU) from the Sun (one AU is defined as the mean distance from Earth to the Sun, or about 149.6 million kilometers - for comparison, the most distant planet in the Solar System, Neptune, is on average 30.1 AU from the Sun). Radio signals traveling at the speed of light (299,792 kilometers per second) need more than 20 hours to reach it. Voyager 2, which dove below the plane of the Solar System after departing Neptune, is 119.8 AU from the Sun; radio signals need about 16 hours, 42 minutes to reach it. Voyager 1 became the first spacecraft to pass beyond the heliosphere, the bubble of space where solar particles and fields are dominant, in August 2012. Voyager 2 joined it at the edge of interstellar space in November 2018.